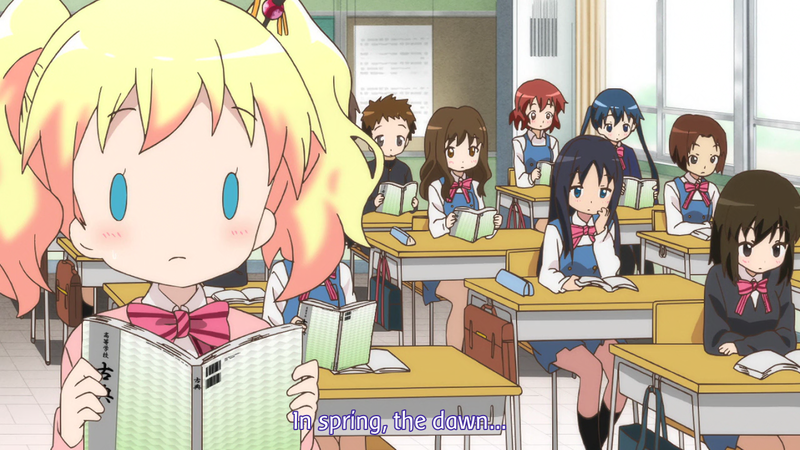 Kin-iro Mosaic – 02 | Mezashite! 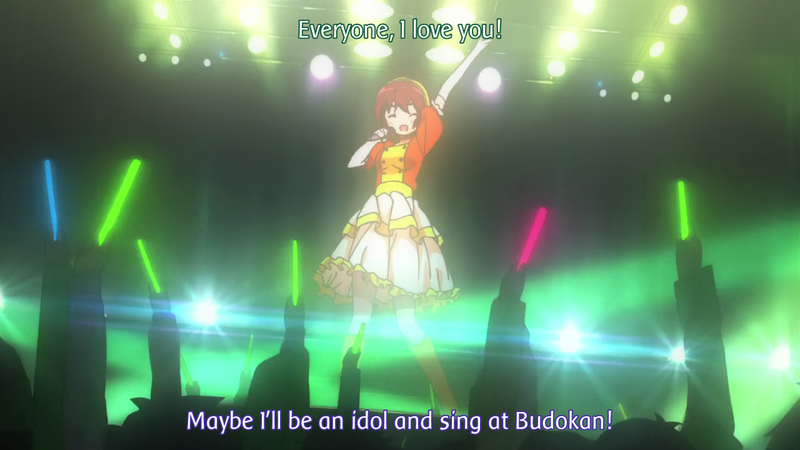 Here’s an episode of … not-Aikatsu! 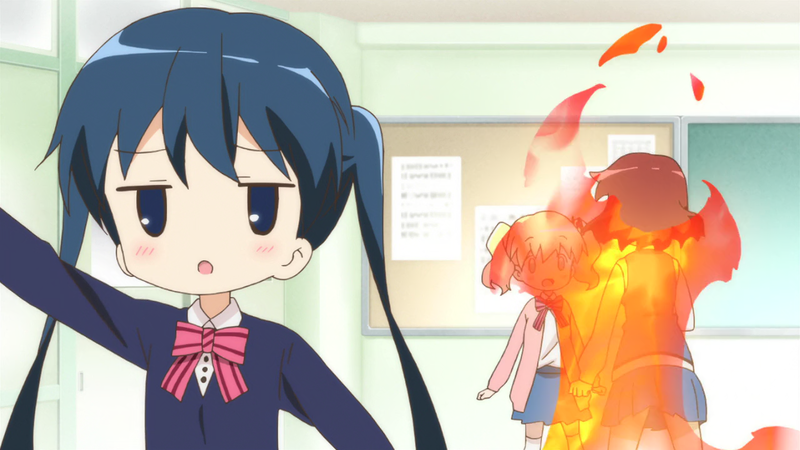 Aikatsu is delayed until whenever it gets done. TL notes for Kin-iro to come in the next hour or so. Akatsukin: So, you might be wondering where Aikatsu is right now. You ever have one of those weeks where everything you thought you knew was wrong, and your entire life was turned upside down? Add that to 22 hours of plane traveling and you’ve got my last week. Not to blog (ha ha), but that’s why delays. Kiniro out because Etoce did all the hard parts so I got to rest. Most likely release tomorrow. Japanese schools are cheap and don’t have janitors and stuff, so the students do a lot of stuff. Not that that’s what this is referring to. 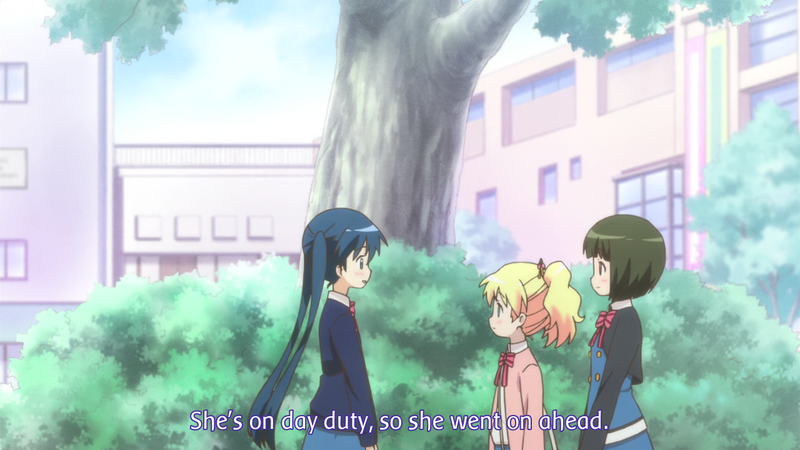 Day duty refers to whoever is in charge of a certain thing that day. Which… completely did not need me to explain it. 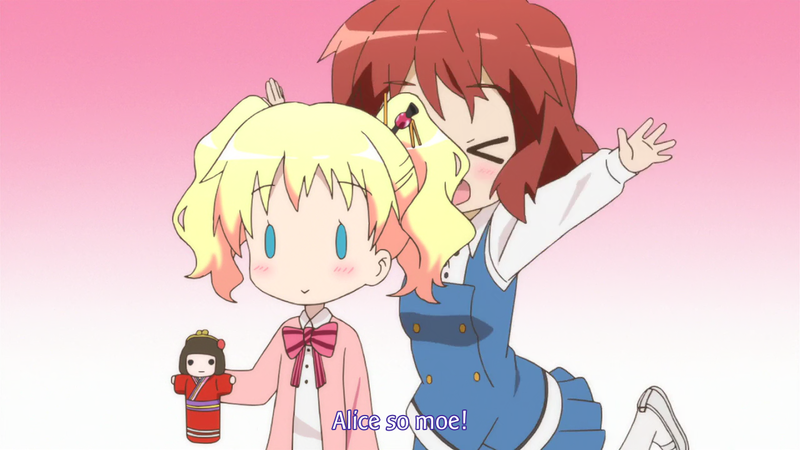 I don’t think they actually explained what moe was, but I don’t think I need to, either. Akatsukin stopped me from using the word ateji in the release, but it does have… whatever, it’s all explained in the wikipedia article. 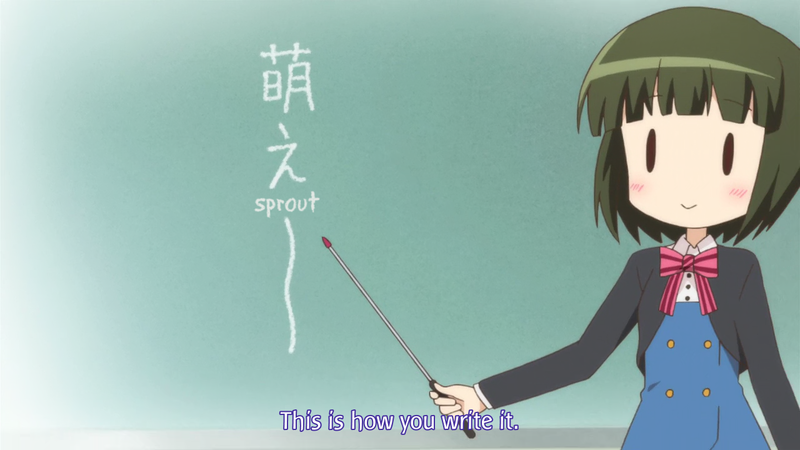 Basically, Shinobu is saying that the “moe” character (萌) doesn’t have anything to do with the meaning of the word specifically — it’s just an onomatopoetic way to write the word. 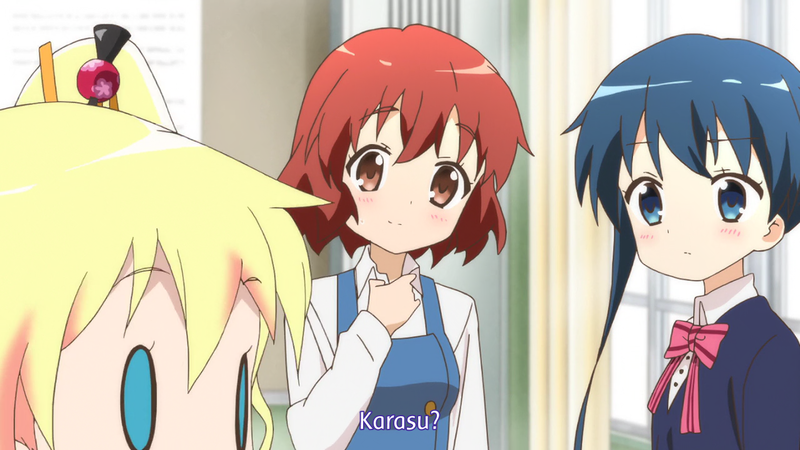 金髪 (kinpatsu, blonde hair) and 禁バツ (kinbatsu, rejected) sound similar. This is from The Pillow Book (枕草子 makura no soushi) by Sei Shonagon. 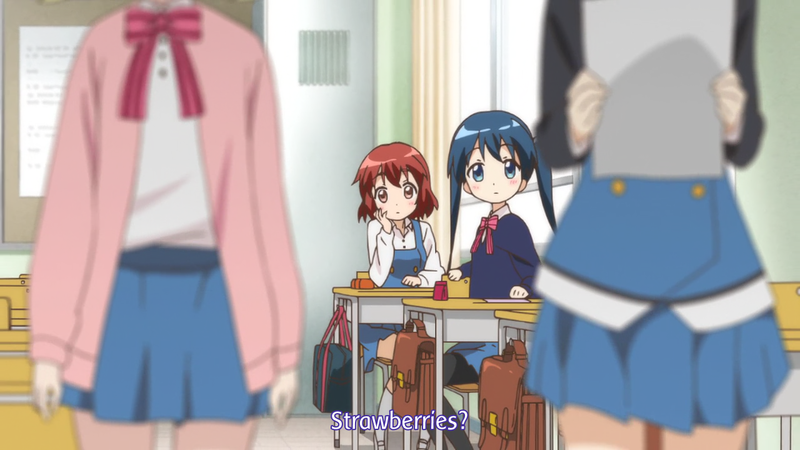 The line in question is 春はあけぼの haru wa akebono. YAY!!! Thanks for the episode. Downloading. Thanks for the episode! 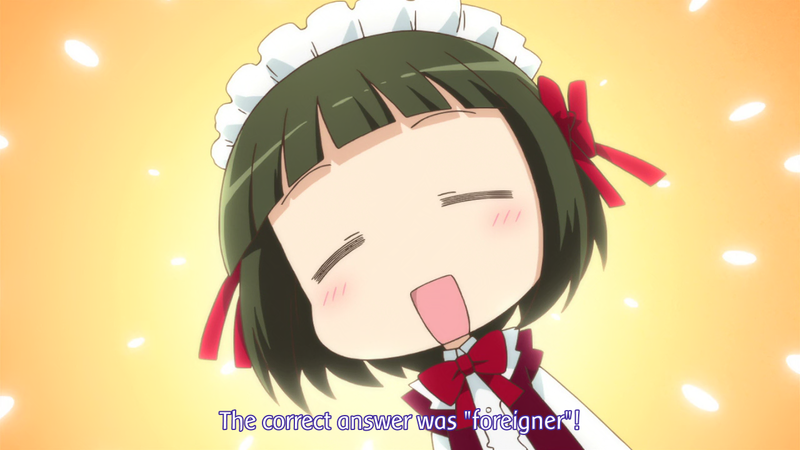 Waiting for Aikatsu and more Yurika-sama. 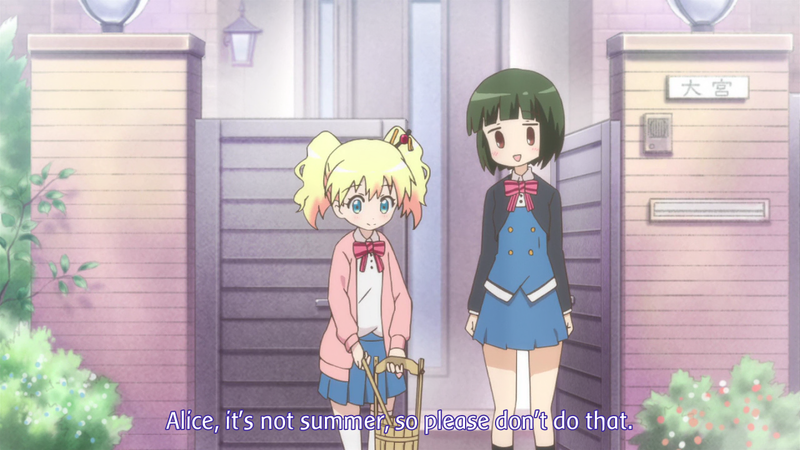 “watering the sidewalk” is explained in an episode of precure: max heart. 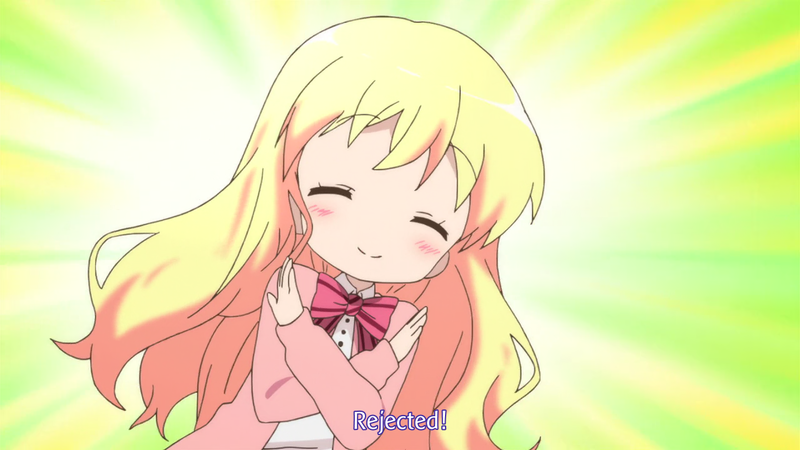 I like this new series, but where’s Aikatsu 39? 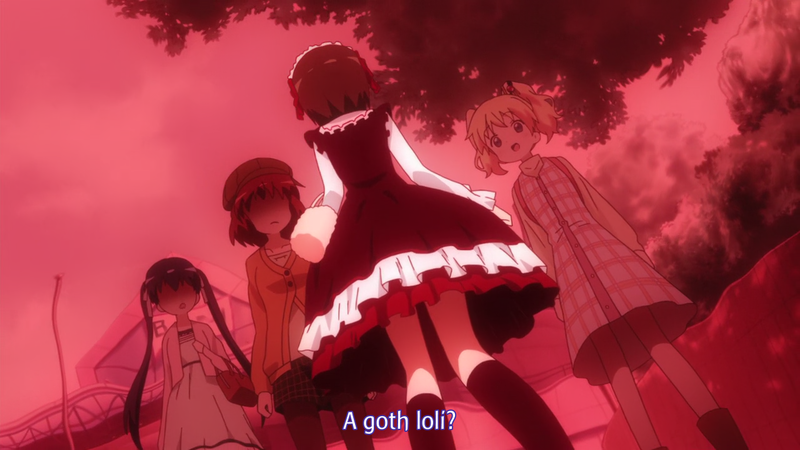 A simple idol anime turned into one of my favorite shows of the moment.